Amina and Sarah Said were normal American teen-aged girls. Actually, that’s why their father killed them in January 2008. 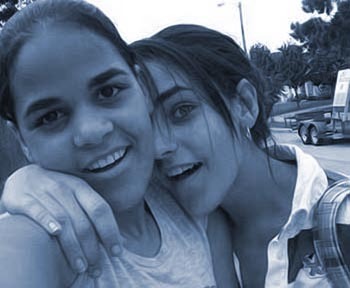 Photos show a pair of happy, beautiful sisters. Amina was 18 yrs. old and Sarah was 17, but their smiles hid a deep fear of their father, Yaser, who is an Egyptian Muslim. When the girls were nine and ten, their mother and her sister filed a report of sexual abuse against Yaser with the Hill County Sheriff’s Department near Dallas, TX. Yaser took the girls on a trip to Egypt when Amina was just 15 yrs. old, apparently looking for a husband for her, because she called home to her mother, hysterical because her father wanted to marry her off to a man in his 40s whom she didn’t know. Later, he tried to pair her up with a cousin and other Egyptian men. Under Islamic law, the girl is supposed to agree to her father’s choice of a husband and Amina always refused. The girls’ mother, an American with little education, had married Yaser as a teenager herself and lacked the self-confidence either to stand up to him herself or defend her daughters from him. By the time she was an 18 yr. old high school senior, Amina had a boyfriend and a cell phone; Sarah, a junior, did, too. They took photos of each other and Amina talked on the phone with her boyfriend. And then her father found out. He hit her, kicked her in the face, and cut her lip. Amina told her friends that her father would kill her if she dated American boys. He had threatened her with a gun before. He wanted his daughters to be Muslim, to act like Muslim women are obligated to act under Islamic law, to wear conservative clothing and marry his choice of an Egyptian husband as soon as they graduated from high school. Amina and Sarah didn’t want to be Muslim: they just wanted to be like their American high school girlfriends. The 911 phone call came into the Irving Police Department the evening of New Year’s Day 2008. It was Sarah’s voice on the line, gasping, “I’m dying, I’m dying…;” she said her father had shot her and her sister Amina. Their blood-soaked bodies were found in the Yaser’s taxi, but he had taken his passport and fled the country, probably back to Egypt. He has not been apprehended. Relatives called it an “honor killing” and eventually the FBI did, too. In October 2008, the FBI finally named Yaser Abdel Said a “featured fugitive” on its online website. Islamic law doesn’t call it “honor killing,” but very specifically holds that a Muslim father cannot be held “subject to retaliation” for killing his own offspring. In modern Muslim countries such as Iraq, Jordan, Kuwait, Syria, Yemen, “honor killings” typically are treated with leniency and mitigated sentences.